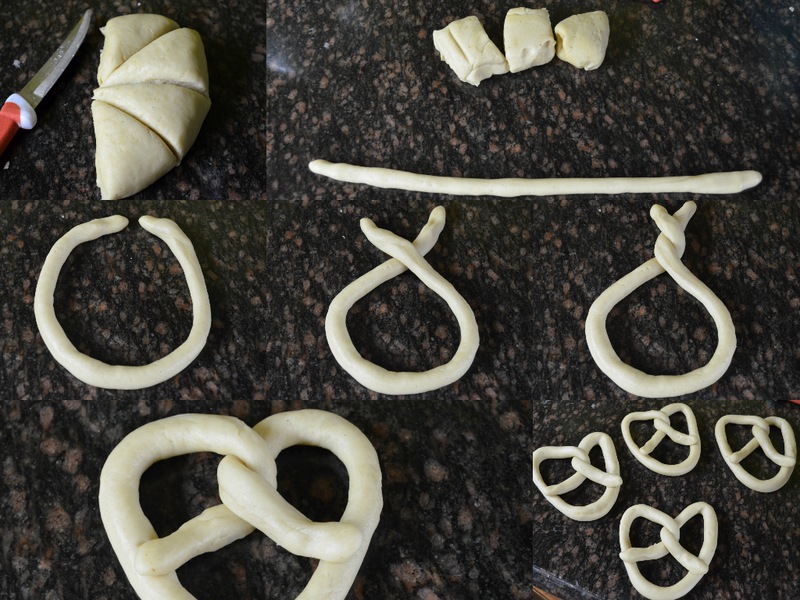 Who knew making Pretzels was this easy?! 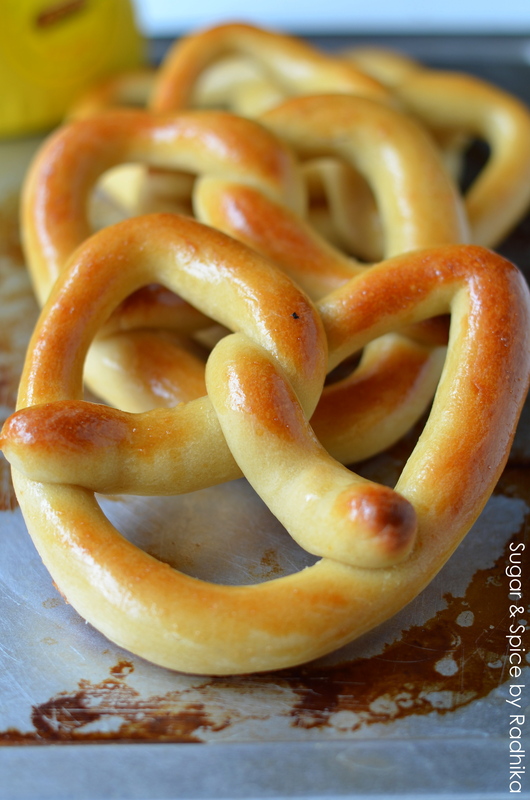 Try this ever so easy pretzel recipe and make your very own sugar and cinnamon pretzels at home! 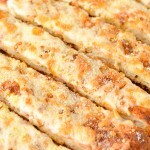 My pretzels are the ultimate soft pretzels which can be eaten on their own, with a little sprinkling of salt, with cinnamon sugar or loaded with cheese (cinnamon sugar is my personal favorite btw), they taste perfect anyway you make them! All in all these took me 2 hours to make where my dough was resting for an hour and the other hour I spent trying not to be clumsy. If you know your way around the kitchen and aren’t as slow as I am, you should be done 15 minutes sooner! 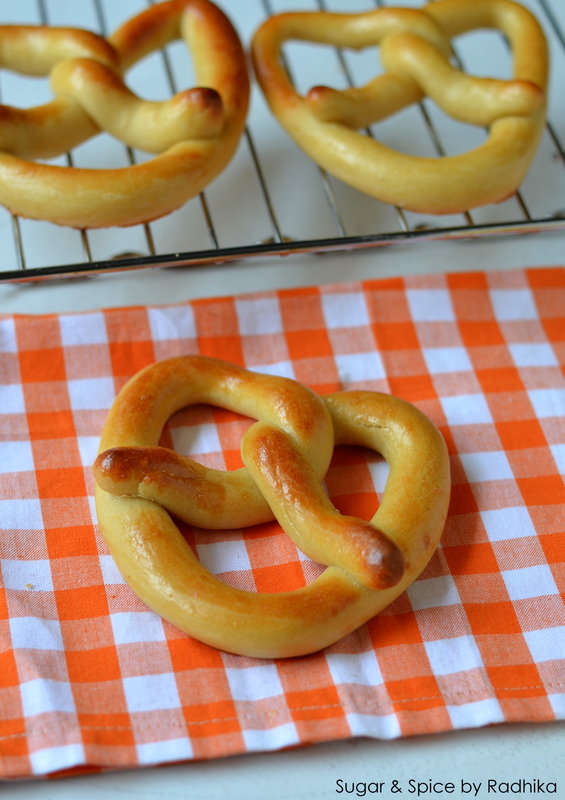 This is a quicker recipe because I’ve avoided an unnecessary step of dipping my pretzels in a baking soda bath. I didn’t have baking soda and quite honestly I wasn’t interested in spending my time soaking my pretzels in baking soda bath rather than reading my Game of Thrones book. Baking soda bath is basically done to get that extra brown color and that pretzely crust but I’m not a perfectionist and cutting a few corners isn’t something I mind so I thought why not skip it?! And I did..result? 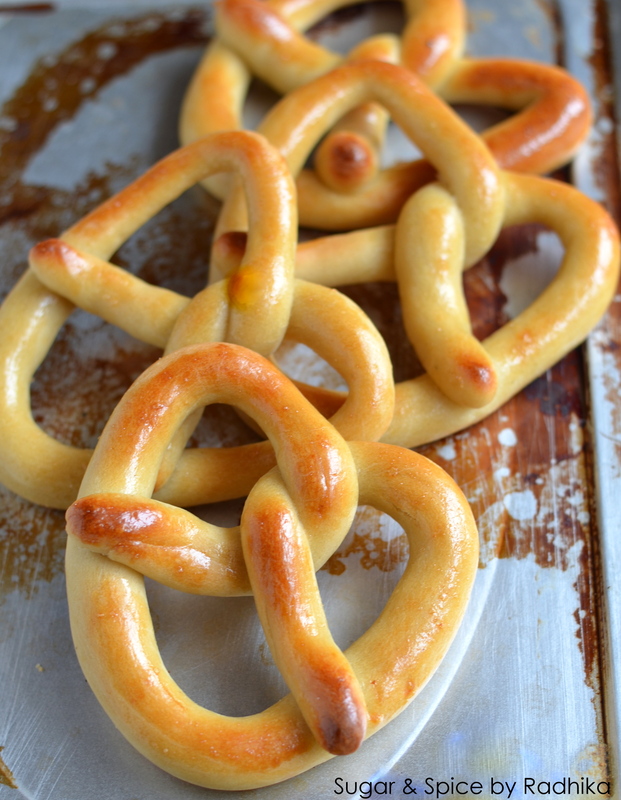 I still managed to get a golden crust by broiling (only top grill on) my pretzels for 2-3 minutes. 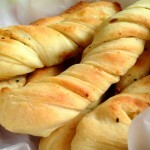 It wasn’t as perfect as market brought pretzels but mine will pass for good quality soft near authentic one. And since when have homebaked goods been all perfect ? I mean what’s the need?! Imperfection is what stands us apart doesn’t it? But if you’re still insistent on having authentic ones simply boil your pretzels in 9 cups of boiling water with 2/3 cup of baking soda. Add the baking soda first to the water, let it boil and foam up then reduce th heat to medium and gently boil pretzels in them without overcrowding. I haven’t tried this method yet because I’m too lazy plus I don’t have baking soda. Its Alton Brown’s method so you can be sure it’ll be fine. Once your pretzels are ready the fun part begins. 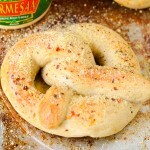 I never like to have my pretzels plain (unless I’m having them with tea) I love a little cinnamon sugar, some with mozzarella and parmesan, herb sprinkling..just about anything you likr! You can also brush your pretzels with pesto before loading them with cheese (learnt that on pinterest). 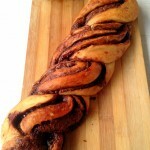 Gather your ingredients and get ready to twist now! Start by activating the yeast. In a glass of warm water mix in 1 teaspoon sugar and stir until completely combined (make sure the water is still warm after dissolving the yeast, the water tends to cool down a bit due to all the stirring). Sprinkle the yeast over the warm water and mix. 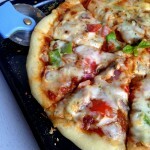 (If you’re worried about this step read my Calzone recipe for detailed instructions with pictures). Cover the glass with cling film or plastic wrap tightly and keep it aside for 10 minutes. After 10 minutes you will notice that the surface of the water will be all foamy, if its not then your yeast has probably died, so repeat this step again. In a bowl, mix together flour, salt, 1 tablespoon sugar and melted butter.. Slowly add in the yeast water until you form a ball of dough. The dough will be not be sticky and will be easy to manage. Toss the dough out on a lightly floured surface and knead for 4 minutes. Lightly coat the dough with oil and place it in a large bowl lightly coated with oil too. Cover tightly with plastic wrap and let it sit in a warm place for 1-2 hours or until the dough doubles in size. This time can vary depending upon the quality of the yeast used, mine took around 1 hour. If you can’t find a warm place to keep it in then simply preheat your oven to 200 degrees and keep the bowl in it until the dough doubles in size. Punch all the air out of the dough after it has doubled in size. Cut the dough into 8 pieces with a sharp knife. Roll out each piece into a ball. For the pretzel shape, roll out one ball into a rope shape. 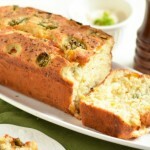 Try making it thin but not too thin so that it doesn’t loose its shape after baking. If the rope will be thick the yeast will rise after baking and you’ll end up with a pretzel bagel sort of thing. Preheat your oven for 5 minutes at 200 degrees Celsius. Bake the pretzels for 12 minutes at 180 degrees Celsius, after 12 minutes turn on the top rod of your oven only (also known as the Grill/Broil mode) and grill the pretzels for 2-3 minutes. Watch them closely so that they don’t burn. This will make the top shiny and golden. You can have the pretzels now, with a sprinkling of salt or herbs. 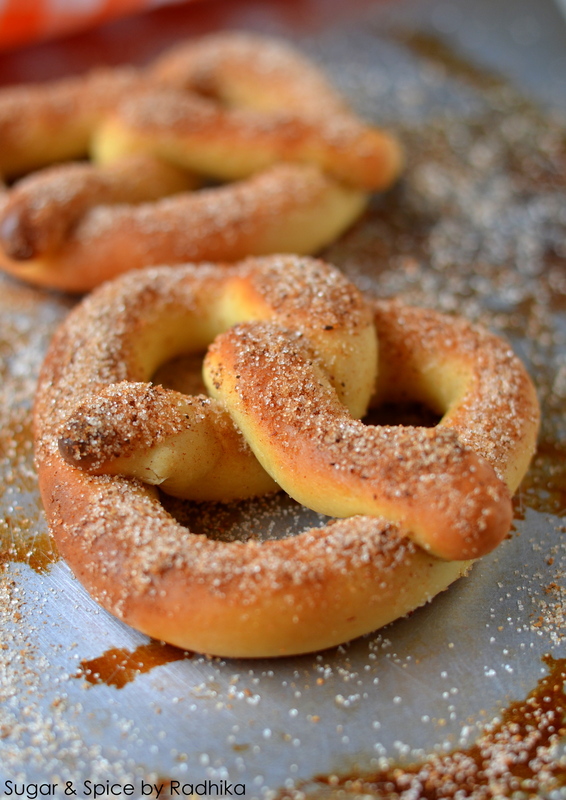 For sugar and cinnamon pretzels, mix cinnamon powder and sugar in a bowl, brush the top with melted butter and dunk in a cinnamon sugar mixture. 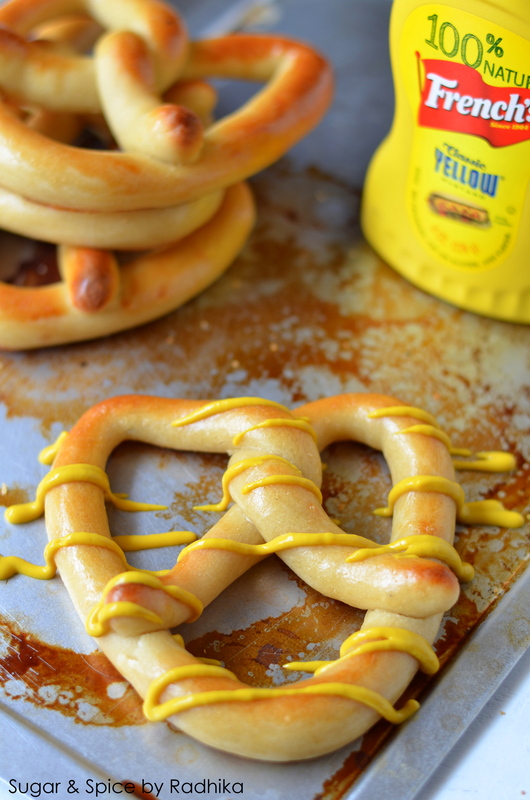 You can sprinkle some more on top and the bottom of the pretzel. Return it to the oven for 2 more minutes at 180 degrees celsius. 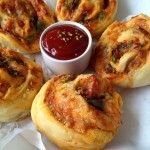 You can try a number of toppings like cheese, pesto..do what you like with these ! 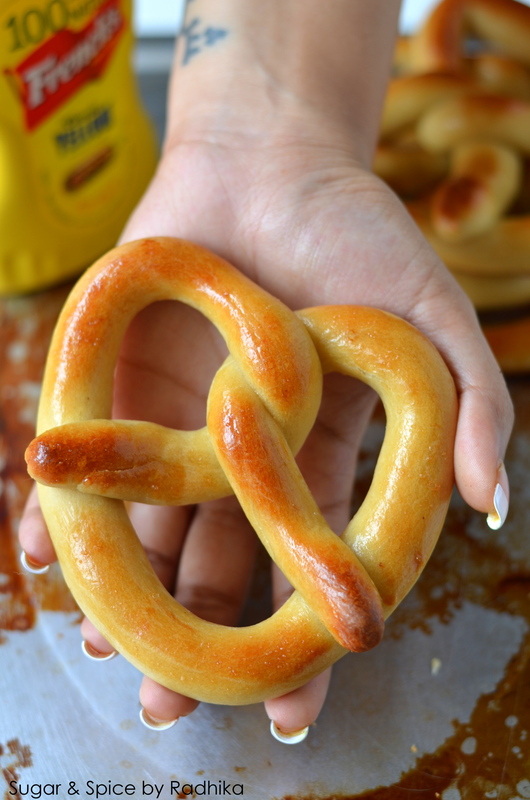 This pretzel recipe is the only one you need. 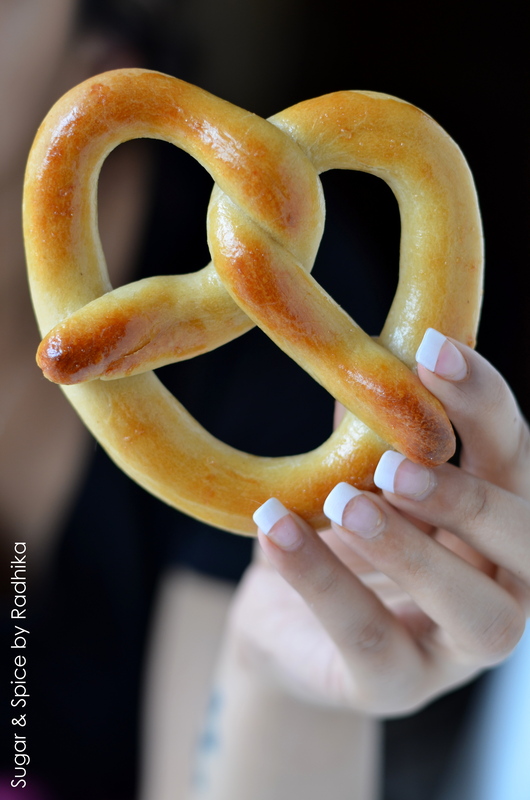 NOTE: These Pretzels are best eaten the same day. They will lose softness the next day. They look great, definitely on my “to-bake” list. Thanks for sharing! 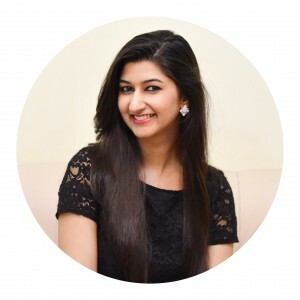 Hi Nishita, You could brush the top with a mixture of milk and melted butter (more butter less milk). It won’t brown as much but that’s the closest alternative to eggs you can use here. 🙂 hope that helps! but will it affect the taste? 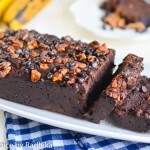 Like I mentioned in the recipe, it’s purely for looks! Egg helps in even browning and in getting a beautiful shiny top. It will not affect the taste at all! what can be used in place of eggs for that sheen on top? Will milk do? or anything else..?